How to Acknowledge Sponsors...in a Song. We come across this issue frequently--especially in forums, associations, or events with a showcase/tradeshow component: How does one give sponsors appropriate face time in the main event? We've seen logos on the wall, in PowerPoints...we've had emcees and presenters thank them, we've had sponsor signs in break tables, etc. All of these things are good, but in addition to those we like to thank sponsors...in a song. Not only is a parody song funny and engaging, but it ensures that every attendee is paying complete attention when the sponsor is getting their name-check. Sponsors are often very important and they deserve a little fanfare. The video in this blog is Neighthan the Horse, thanking the sponsors to the tune of "My Favorite Things" at an event. Not only do they get a name check, but they also have a line about what they do--elevating the sponsor shout-out above a slide with logos and a round of applause. Internal speakers get a bad rap. Professional speakers--again, only for the most part--manage to avoid such pitfalls. That's not to say there aren't exceptions to the rule: I've seen fabulous internal presenters and pretty lousy professional keynote speakers. It's just that when one makes their living doing something, they tend to do it fairly well. 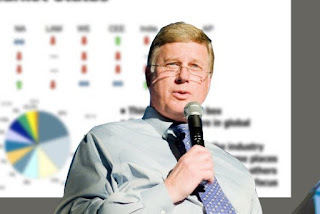 A company probably didn't hire a CFO to give an ace 50-minute presentation once a year at a sales meeting...they probably hired them to be really, really good at company finances. So presenting really *isn't* an internal speaker's main job--they already have a job to do, and one can hardly blame them for giving a comparatively small presentation the short shift when their main focus is on their daily responsibilities. Recently I stumbled on a discussion of event industry professionals centered around poor presenters. The general consensus was that companies should hire professional presenters to escape from the trap of sub-par internal speakers. Well, that might work for a keynote speech, of course, but I would say that not only is this financially prohibitive on a bigger scale, but it's also unrealistic, largely unnecessary and can take away a lot from the meeting--including critical information. After all--if you need someone to give the financial picture for the company moving forward, the best person to do it is someone internally who deals with that particular facet. Make it an Interview. A dialog can be much more captivating than a monologue. Have an emcee or dynamic colleague ask the presenter pointed, relevant questions. Keep the conversation focused and moving along. If one is feeling like doing something different for an event, one could even stage the general session like a talk show--keeping the same emcee to transition between different subject matter experts. Present as a Team. The head of a department can give a brief overview, and then hand off to members of their team to present--or presenters can take turns. Not only does this change who's on stage--adding novelty and re-engaging the audience every time the presenter changes--but it can also be a great opportunity to let a team share in the "glory" and let themselves be known to the audience. Keep it High-Level. Internal speakers are often subject matter experts that spend all of their days doing their job in the area that they are speaking about. It's great that they're passionate and knowledgeable about their subject--but it's not often that the audience shares the same level of enthusiasm. For instance--a sales force doesn't want to (or need to) know *all* the little nuances of the marketing process and department and plan--they just need to know the parts that are relevant to them and will help them most in their job. Information overload can be prevented by keeping everything very high level--the presenter should think about what's important to the audience as opposed to what's important to them. Case studies are also great. A presenter doesn't have to tell the audience how program X will benefit them--give a case study. Better yet, call the case study subject on stage to interject their story during the presentation. Variety, multimedia and novelty are all key in keeping the audience off the Blackberry and on the presenter. Have a global, pre-defined and assigned set of outcomes. Having a set of clear outcomes for an event is huge. Define outcomes and give them to presenters. If they want to talk about something, it must somehow support one of the outcomes. If it doesn't, they either cut that information, or renegotiate. Every presentation should support the event--and having a cohesive set of outcomes both within the event and within each presentation will keep everyone on-message (and prevent speaker-speech-wander). Don't be afraid to cut time when it's not needed--just because you've always allotted 90 minutes for the marketing team, doesn't mean they have 90 minutes of relevant, outcome-based content THIS year. Rehearse. It's torture to sit through an already-dry presentation only to be confronted with technical glitches, "What happened to my slide? Can you go back one? ", and unprepared speakers. Internal speakers have regular jobs within the company, so they're not always given adequate time to rehearse. This isn't just an on-site task, by the way. Reviewing their presentation as they go along with a trusted peer, team-member or assistant (anyone with an honest, knowledgeable, critical eye) can keep it on-point and fresh. Toss the PowerPoints. Look. I've heard it hundreds of times; "Well, [CEO, CFO, CMO, VP, Etc.] is just going to do his/her slides on the plane before the event...so there's not much *we* can do about it..." Not only does this tie in with not rehearsing, but if a presenter doesn't have time to prepare in advance--cut the slides! Not only do night-before slides have infinitely more mistakes, but they're also much more likely to contain the speech instead of being a speaking aid. Consider supplementing PowerPoints with handouts, or even a recording of the presentation (or presentation notes) on a website after the event. One of the unique techniques that we use to enhance face-to-face communication: parody songs. Maybe it seems silly to use a parody song at a corporate event or in a serious video--but using parody songs to communicate or review key messaging isn't just a one-note wonder (ehhem...). They're a smart, brain-based way to engage the audience with the content; at an event, in a video, online, or in person. Think back to when we were kids; the most important building blocks in education were taught...through song. The "ABC's" and "1-2-Buckle my Shoe" were instrumental in getting toddlers reading and counting. Programs like School House Rock taught older children about everything from conjunctions to the process behind being a "bill on capital hill". 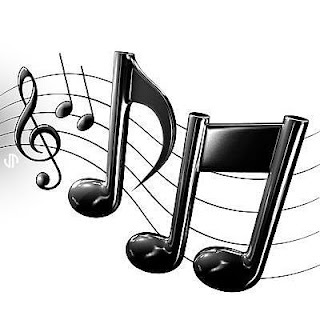 Simply put, music and songs can help us learn--and that doesn't stop in childhood (nor does it need to stop outside the door of a corporate event). Engage both the creative and pragmatic areas of the brain. Promote a positive learning experience. Manipulate an audience's emotional state (try frowning while listening to a Sousa march). Are a novelty that captures attention. Can stick in your head (talk about message reinforcement!). Are just plain fun--to listen to AND to write. Most of all, they promote learning in a unique way that interrupts the expectation of "learning as usual"--engaging an audience in a very powerful way. We used opera in this example because it was appropriate for the subject matter and the audience, but we've also done parodies of popular songs, classics, oldies, etc. Now that's NOT just information about Social Security as usual. Psst... Don't Set the Tone for Another "Boring" Meeting! I saw the above image on icanhascheezburger.com (a popular site dedicated to the internet phenomenon of "Lol Cats"--cats with often-misspelled captions that make you laugh out loud). This poor captioned-kitty isn't alone in its feelings. 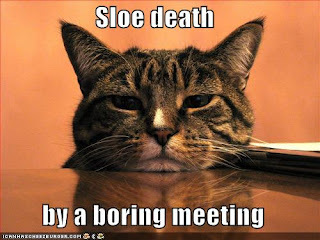 In fact, around the internet--whether in advertising, cartoons, or lol cats, the joke is on meetings: corporate meetings are "boring". Period. Everyone "knows" it. It's ubiquitous and universal. So when a company hosts a large meeting or event, they're already fighting against that preconceived notion which, by the way, has *plenty* of evidence to back up the perception. Changing your meeting from boring to effective is one task (and it's not so monumental as one might think), but how does one change that, "This meeting is going to be booooring" attitude BEFORE the event? It starts before attendees walk in the room, get on a plane or leave their homes. Pre-event materials that are fun and focused. Don't miss the opportunity to "market" your meeting--even if it's an internal audience. Send them pre-event reminders, building up excitement and making it clear that this will NOT be a typical meeting-as-usual. Pre-event videos. Record a clip of the keynote speaker, president, CEO, etc., previewing the event. In our case, if a company has used an AniMate in the past, we'll have the AniMate record the message conveying his/her excitement for the upcoming event. Pre-event buzz. Bring your event online. Create a website, if possible, detailing the event and providing a space for attendees to talk about it. You can also use social media outlets--like Facebook or Twitter--to get discussions going about what people want to take away, personally, from the upcoming meeting. Surveys and pre-work. Send out pre-meeting surveys, asking attendees what they'd like to see at the event. Even if presentations aren't flexible, these issues or questions can make the presentation more relevant for attendees. If necessary, there can be a special time dedicated to addressing key content, or a presentation can be swapped out for a more relevant one. You can even assign attendees pre-work that prepares them for the event at hand. Publish the Agenda. Distribute the agenda along with key take-aways. This prepares attendees for the learning that's about to occur in the event and also gets them thinking about how it will be relevant for them. Of course, pre-event materials do only a fraction of the legwork in changing the perception of the event. The real proof is in the pudding--as they say--but get the audience to expect something that is going to be different than the usual, and they'll be more receptive to your messaging from the get-go. Now putting that change into effect once they get into the room (and immediately when they get in the room) is another list altogether. Business persons practicing through the 1980's are feeling a striking sense of deja vu with the current economic situation. The impact on businesses--particularly in regards to how they view their events and meetings--is also similar. We reflect back to when Live Spark was in its infancy, and Dan Yaman, our founder, regales us with tales of companies in difficult times; merging, scaling down, participating in acquisitions, etc. In fact, Live Spark's predecessor company was started on Black Monday--and the term ignorance is bliss had never been more true. It may not have seemed like the best time to start a business, but it ended up being the perfect time for the company to introduce itself to the world. 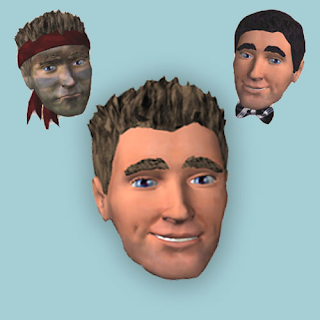 At the time, Live Spark was known as Interactive Personalities--specializing in AniMate technology--real-time animated characters--instead of the entire spectrum of event design. What happened during that time, was that companies going through significant change due to the economy or simply restructuring started contacting Dan and company. "We need an audience advocate," was the request. Companies were still bringing their employees together for meetings--in fact, meetings were even more critical than ever for getting everyone on board and reassuring them with the new company visions. But what companies realized was that their audience needed a voice. An audience in a state of uncertainty, or sitting in a meeting unconvinced, is an audience that is not receptive to new messaging. Likewise, when a company has issues that are unresolved, not addressing these before moving forward into mission-critical content is like putting a drop of water in a bucket of soup; the water is still there, but it's diluted by the simmering broil of the pot at large. An audience advocate--in the form of an AniMate--was a transformational presence in these events. Instead of CEOs and Executives talking AT the audience, they were able to talk TO them in an intimate way--even in a crowd of thousands. Kept the audience entertained and focused by interjecting humor. Brought up questions that were on the minds of the audience when an new concept was introduced. Voiced issues and objections so they could be addressed and the meeting could move forward. Provided an opportunity for top-level personnel to show that they understood what was going on, and were "with" the audience. Increased unity and feelings of company loyalty in a time where boosting morale and motivating employees was absolutely critical. As we experience a deja-conomy of sorts in 2008 and heading into 2009, we're seeing more and more need for the audience advocate. As businesses find themselves in undesirable positions (or, sometimes, great positions, but with a high degree of change), the need for the audience to have a voice in the process grows. Though these AniMates have always been part of our toolbox, they fill a very specific niche in tough times that truly makes an impact.